"I passed my checkride with flying colors.... RideReady was a lifesaver!" - MV - RideReady User. How do I purchase the Android™ versions? Click on one of the links above. This will take you to the Android™ AppMarket™ where you can purchase it just like any other App for your Android device. Yes! Our RideReady apps are designed to naturally contour themsleves to fit a number of screen sizes and resolutions. 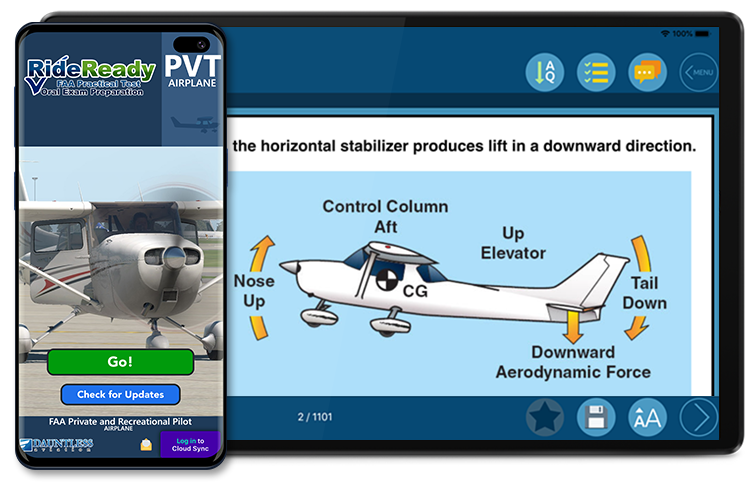 While you should always supplement your study with additional soruces, such as your aircraft`s POH/AFM/RFM, in general, yes, RideReady can be your primary source for checkride preparation. 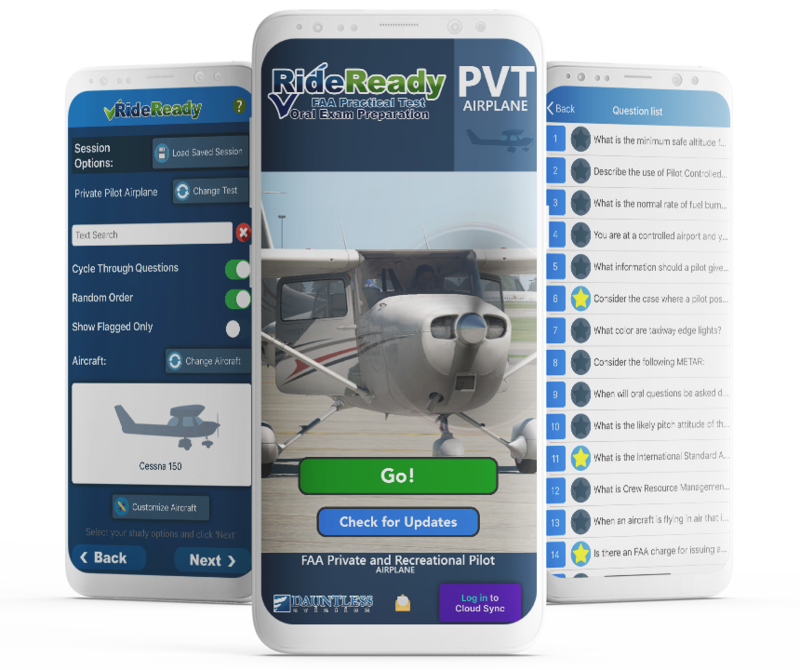 Thousands of pilots have enjoyed checkride success after seeing that the vast majority of questions they were asked during their checkrides were covered in RideReady. It is a complete checkride oral preparation system. I want to use both the PC and Android™ software. Can I get a discount? Unfortunately, the app must be purchased seperately if you`d like to use both. The reason is that the Android apps must be purchased via an App Market and there is no effective way for us to fairly integrate sales with our database of PC users. Here's the really cool thing - the Android™ apps feature a built-in update mechanism. What this means is that with just a few clicks, our app will check the internet for updated data and download them to your device as necessary. This is integrated, fast, and free for those who have purchased the app. No, you don't! Once an app is installed on your device (after you purchase it from the iTunes™ AppMarket), you don't need to be actively connect it to use it. This means, for example, that you can spend your time in a passenger seat of an automobile or aircraft studying even when you don't have an active internet connection. Of course, you need to have an internet connection to your device to get updates from our servers from time to time, but as far as everyday use goes, you certainly do NOT have to be connected to the Internet. Pursuant to the terms of the AppMarket EULA, this is a LIFETIME PERSONAL LICENSE to ues the app. In other words, it doesn't expire! It will be waiting for you when you need this. Compare this to our competitor whose more expensive product has very short expiration dates, forcing you to pay extortionate continuation fees if you want to keep studying before a test or review later on. The apps feature the same number of questions as the PC software. This varies depending on the title and, occasionally, teh specific aircraft you have selected, but in general for the titles in the airplane and helicopter sections, there are around one thousand questions in each title (a little more for some, a little less for others). For titles in the "other titles" section, it`s closer to a few hundred per title.